Pollard says, "It’s a tremendous industry for the state and it’s who both schools are when you look at who our fan base is, we’re Iowans, and that’s a big part of the Iowa culture and we need to embrace it." He says corn is much more to the corn industry than most people think, as it has multiple uses and he says it has been interesting to learn about that. University of Iowa associate athletic director, Rick Klatt, echoed Pollard’s comments. "At it’s core Iowa is an agricultural state and always will be, it’s a wonderful thing for the University of Iowa and Iowa State University to have a formal relationship with the Iowa Corn Growers and promotions board," Klatt says. 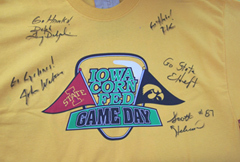 Klatt says the sports contests will help bring attention to the impact of corn on the entire country. "I thought everybody leaned Cyclone," Pollard said. While Klatt suggests the find out in the fall as farmers are in the field and listening to the game. Klatt says he believes most of the farmers now have cell phones and maybe there should be a text message poll during one of the games. While Elsbrend, the new president of the corn growers, is staying neutral.